Sea Glass version 0.1 is ready for you to try! 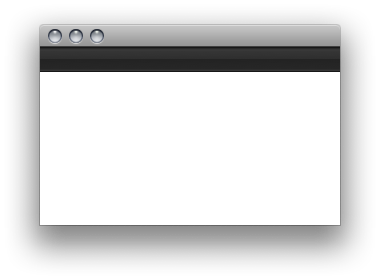 This is a very preliminary version of the look and feel, and is missing artwork for tabs and component focused states. Also note that the artwork will likely change as we move forward based on your feedback. Don’t expect rendering of components to be perfect in this release — text alignment, for example, might not be quite right. The goal with this very early preview is to get feedback on fundamental aspects of the look and feel (e.g. colors). You can download seaglass-0.1.jar or check out the Google Code Download page. You can download the demo (based on Laffy) here. 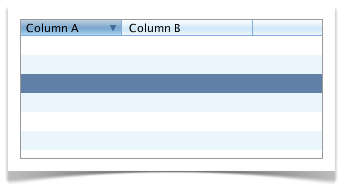 As promised, here is the code to create the iTunes navigation header button. It’s not a perfect replica, but it’s as close as is practical. 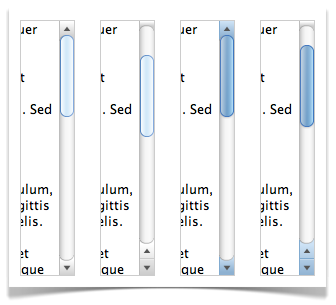 iTunes uses hand drawn artwork, which is not easy to replicate in code. 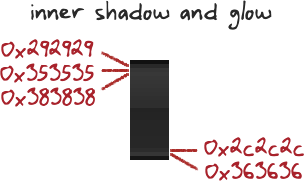 The inner shadows, for example, are simulated in the my code and look decent, but are not a perfect facsimile of the original. These subtle details are almost invisible when you look at the component, but without these details, the component looks cheap and amateurish. 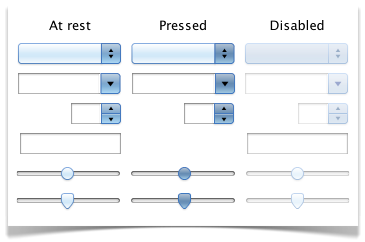 Inner shadow simulation on the left, top and bottom sides of the selected button. Upward pointing shadow under the text. See the comments in the code provide further explanation of these items. To actually create the iTunes navigation header component, you can adapt the code from my last post, with TriAreaComponent. // the gradient colors for when the button is selected. // the border colors for the button. // the border colors between buttons. // if the button is selected, paint the special background now. // if it is not selected paint the left and right highlight border. // paint the shadow text. // paint the actual text. * Paints the selected buttons state, also used as the pressed state. // calculate the middle of the area to paint. // draw the top and bottom border. // paint the outter part of the inner shadow. // paint the middle part of the inner shadow. // paint the inner part of the inner shadow. I haven’t had a whole lot of time recently, but I’ve updated the color palette (see the original colors back here) and drawn some new artwork for the Sea Glass look and feel. Kathryn has been plugging away on the implementation, working hard towards an initial release, which is still a ways off. I’ll let the images do the rest of the talking! 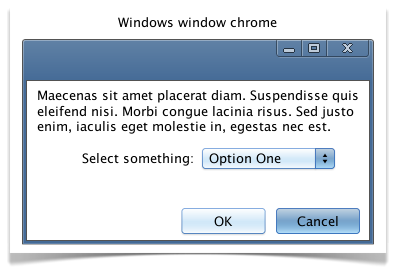 Note that we haven’t settled on the color scheme for the Windows window chrome — suggestions and requests are welcome. I’m not usually into those Mac application bundles (like MacHeist) because they tend to include a bunch of unrelated stuff I don’t want along with one app that I do want. Can anyone say “gorgeous”? Not only is this app beautiful, but it’s also snappy and simple to use. 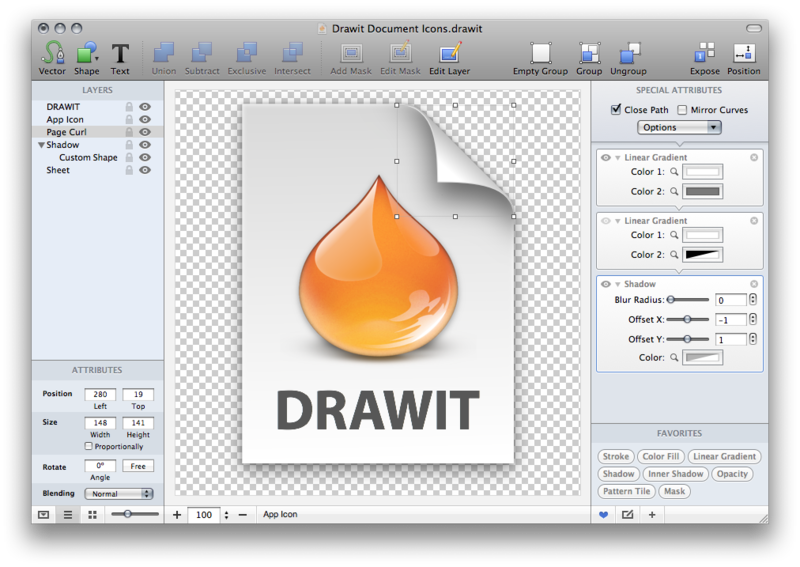 DrawIt will let you create vector art and then export it to a format of your choosing. This app is an absolute must for anyone drawing icons. Picturesque is a simple app, with very targeted functionality. 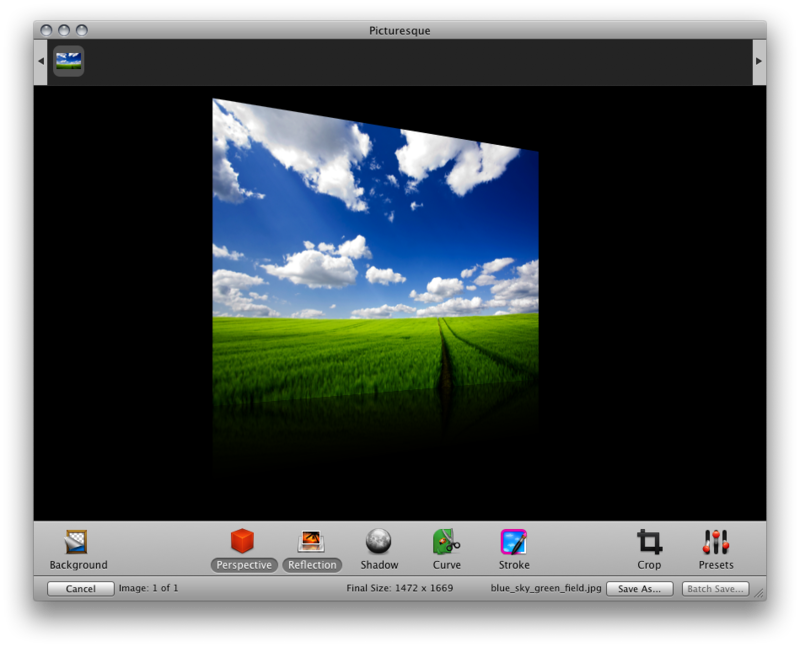 It will let you transform images in various ways, like adding perspective, reflections and drop shadows. For me, this app stream lines my image editing workflow when I want to adjust images for blog posts or presentations. But to really capture the subtleties of the navigation header we need to look closer at the top and bottom of the component, where you’ll notice an inner shadow, and an inner glow. The inner shadow and inner glow are what make the component visually interesting. I chose to hard code the inner shadow and inner glow sizes to 3 pixels (top) and 2 pixels (bottom) rather than produce the real effects. Real inner shadows and glows aren’t straight forward to create (I talked about them here), and are computationally expensive to recompute because they aren’t currently computed on the graphics card. So I decided to hard code the inner shadow and inner glow colors to the exact colors seen in iTunes. You could figure out their grayscale and alpha values to make them reusable — I’ll leave that as an exercise for the reader. // from the font size. // the background colors used in the multi-stop gradient. // the color to use for the top and bottom border. // the inner shadow colors on the top of the header. // the inner shadow colors on the bottom of the header. // LinearGradientPaint with multiple stops. // draw the top inner shadow. // draw the bottom inner shadow. 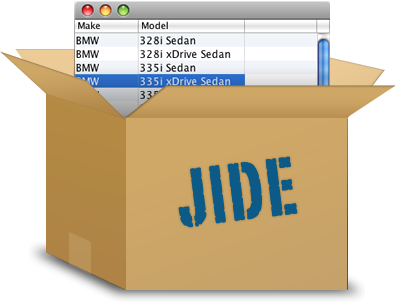 If you’re a JIDE customer, you’ll be happy to know that they’ve incorporated my blog article on Creating a better JTable back into their tables (see their news release here). My article points out a number of things you can do to get better parity with native tables. Tables tend to permeate applications, so it’s important that they look good. If you haven’t read the article, go check it out and pull in the better JTable code into your codebase!